On a fossil fuel car the choice of wheels and tyres is mostly about aesthetics, except for sports cars where grip, handling and performance at speed become crucial. On an electric car, where battery power is typically very limited (at least for the foreseeable future), the choice of wheels and tyres is mostly about enhancing vehicle range, with aesthetics being a secondary consideration and performance at speed being largely irrelevant (the Zoe, for example, is limited to 84mph which is the low end of modern tyre performance). Wheel radius: The lower the radius the smaller the area exposed to wind drag, plus also the wheel weight is typically reduced. Tyre resistance: The design and materials used in the tyre affect how much rolling resistance it has – this can be reduced significantly but there is a compromise with low resistance resulting in low grip and therefore potentially reduced safety. Electric cars are typically seen with small wheels and tyres because of the first two factors – however this does impact the look of them. In recent years there has been a move towards taller but narrow wheels (see, for example, GreenCarReports) presumably as a way to improve aesthetics while keeping wind drag down. For full details see Buyer’s Guide:Wheels and Tyres. So which one is the best to choose to achieve maximum range? 15” (185/65 R15 88Q): width 185mm, sidewall radius 120mm, maximum loading 560kg at 100mph. Total radius 305mm. 16” (195/55 R16 91Q): width 195mm, sidewall radius 107mm, maximum loading 615kg at 100mph. Total radius 310mm. 17” (205/45 R17 88H): width 205mm, sidewall radius 92mm, maximum loading 560kg at 130mpg. Total radius 308mm. It is interesting to note that despite the 1 inch (25mm) difference in wheel (hub) sizes between the options, the difference in overall wheel plus tyre size (total radius) is very small because with increasing wheel size goes lower profile tyre size. Renault has published power consumption figures for the various combinations – these are 146 Wh/km for both the 15” and 16” wheels, and 163 Wh/km for the 17” wheels. These result in NEDC maximum ranges of 210km and 195km respectively. Given that the overall wheel plus tyre sizes are very similar this likely indicates that the most significant factor in achieving high range is the use of EV tyres. Does that mean, then, that there is no range benefit in selecting 15” rather than 16” wheels? Not necessarily, just that it is a small enough difference that Renault has not distinguished between them publicly. 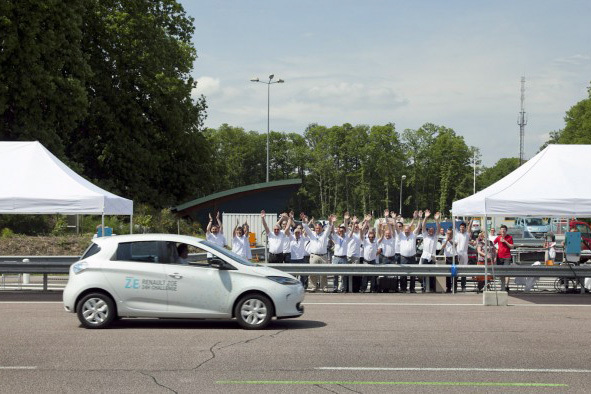 At the same time, it is of interest to note that when Renault set the Zoe’s range record the participating Zoes were fitted with 15” wheels. For information on the wheel and tyre options available when buying the Zoe see Buyer’s Guide: Wheels and Tyres. For information on the alloy wheel accessories available after purchase see Buyer’s Guide: Accessories: Sill, Wheels, Mats, Arm Rests and Seat Covers. This topic contains 11 replies, has 7 voices, and was last updated by Dexter1979 4 years, 8 months ago. – this is a page on the Zoe Description menu. One of the reasons that summer range is better than winter is that the rolling resistance behaviour of tyres in warmer weather drops. Because they all drop, the absolute differences look much smaller. Therefore, you can expect a much smaller difference between wide and narrower tyres in the summer, but that differential will grow in winter. Buzzar – how much more firm do you feel the ride in a zoe is compared to 16″ tyre if you know? my zoe is fitted with the 17″ alloys. honestly comparing it to the 16″ the ride is slightly more ‘bumpy’ & firm but not by much. range – well its hard to notice as i only drove the test zoe on 16″ alloys for 48 hours, but yes there is defo a difference of 5-10 miles max. the only thing i can say is that the 17″ tyres are more likely to burst. i’ve had 2 flats (during 11 months covering 15K) which is more than any of my previous ICE cars. one tyre was a complete write off due to a pothole which literally burst the side wall and it cost me £140 to replace. so just keep that in mind if upgrading to 17″ that in the long run replacements will cost more. but the 17″ do look much, MUCH better!